The day Finn Hester walked into my classroom was officially the worst day of my life. For starters, Finn was good-looking Superhuman good-looking. With curly black hair, neon-white teeth and the brightest blue eyes you ever saw. Me? Well, I don’t want to toot my own horn (that’s what my mum calls it when I say something good about myself), but actually happen to be quite handsome. All my Aunties tell me so. Even Aunt Molly, and she’s practically blind. Ten-year-old Sam is used to being the best at pretty much everything in his world, particularly sport. Just like Sam’s mum is used to being the best cook. Then Finn and his family arrive. Finn is also good at everything, including Sam’s favourite Nippers. Before he realises it, Finn is impressing all Sam’s friends. Sam begins to feel left out and ramps up the competition. As does his mum. But when the ultimate competition goes wrong, Sam discovers that winning isn’t everything. Text font is large and there are scattered motifs throughout. It’s difficult for Sam to adjust when his position with his friends and at school is challenged by a newcomer. No one else seems to be worried when Finn arrives and that makes Sam even more determined to win. At all costs. It takes an incident in the ultimate competition for Sam to realise that winning isn’t everything. A contemporary story featuring indigenous characters. Recommended for newly independent readers ready for a longer chapter book. Her mouth was a slit and her eyes were hard. ‘Now do you understand, Michael?’ She only calls me Michael when she’s angry. Michael wants a dog. Really, really wants a dog. Unfortunately, neither his mum nor his dad share his enthusiasm. They articulate many reasons, and although he has an answer to every objection, the answer is still no. While he tries to change their minds, he sets about showing his parents just how responsible he is. There are colour illustrations on every opening. ‘A Dog’s Tale’ is a new title in the popular and engaging Mates series from Omnibus Books for young readers. Each tells a particularly Australian-flavoured story, full of humour. Michael is not the first child to want a dog, but his determination to prove his responsibility is unparalleled. No effort is too much, if it might change the decision about a dog. Love the illustrations from Tom Jellett, particularly the dog Michael takes for a walk. Recommended for newly-independent readers. If I were a bird, I’d want to be a bird in a cage. Birds that sing with happiness are in cages. They are looked after, they are loved and they belong to a family. I think that’s the best life for a bird. Eleven-year-old May Tang lives with her extended family in Shanghai. Her brother is in Australia learning English, but otherwise she’s happy with her family and her friends and their lives. But it is 1989 and change is coming to China, whether she realises it or not. Almost before she can imagine it, her family is split, and she and her mother are travelling to Australia, with no plans to return. May is not happy, despite assurances from her family that this is a good outcome for them all. Her arrival in Sydney is confronting, particularly when her beloved brother greets and then leaves them. May realises that no matter how she feels, this is reality and her mother needs her help. Slowly, May adjusts to this very foreign new world. Australia’s migrant story is an ongoing one, with new arrivals every day. There are many reasons that families come here, making great sacrifices to do so. May Tang has been relatively protected from the political atmosphere in China, but events in Tianenmen Square in 1989 herald a change for her. This is a story of family, of growing up, of finding ways to survive and thrive when your world is turned upside down. Mei Li, her grandfather’s protected and loved bird in a cage, sings a beautiful song. May discovers that there is life beyond the safety of her family home and that there are many songs to be sung in freedom. Recommended for mid-primary readers. My family never owned a NICE barbecue bought from a shop like other people. Dad thought shop barbies were for WIMPS. Whenever we’d see a barbecue at the hardware shop Dad would shake his head. The ‘Mates’ series from Omnibus are early chapter books are tall tales and true from Australian back yards. Sarah narrates this story of her father and his recycling and building adventures. She is captivated by his building projects, even the ones that don’t quite work. ‘The Great Barbie Disaster’ is full of fun and sure to have young readers giggling. Recommended for newly-independent readers. I make up songs in the shower, while I’m doing my homework, when I’m bored, and even in my sleep! Who cares about fame? I just want to sing, sing, sing! Maddie loves to sing. No matter what she’s doing, singing is part of her day. She also loves whales and when she, her mother and her grandmother set off north to do some whale watching she spontaneously composes and performs a new song about whales. It’s a long car trip and there’s plenty of time to sing together. Everything is perfect until the car stops and can’t be started again. Maddie worries that they will miss out on seeing the whales. Black and white illustrations appear on every opening and each page has a border that could variously be interpreted as pattern, path or more. Maddie and her family have split up to holiday, boys going to Tasmania, the girls going to see whales. Maddie tells her own story and that includes the challenges of having brothers, and worries about their aging car and caravan. Maddie shares her (extensive) knowledge about whales on their journey, her mother and grandmother shaping their holiday around her interests. Text is large and illustrations appear on almost every page, making ‘Born to Sing’ ideal for newly independent readers. Moments later, a very dusty girl emerged from the attic, an old blue box with gold trim tucked under her arm. Frieda and her parents leave Germany in 1913 for Adelaide, Australia. Her father is keen for adventure, her mother will hopefully be more well. Frieda is in two minds, sad to be leaving her grandmother behind, nervous and excited about the unknowns of moving to a new country. But the world is changing and their initial welcome turns to suspicion. Frieda doesn’t understand all the nuances, but she’s aware of the growing tension. Germans are not as welcome as once they might have been. Her mother’s illness both restricts Frieda and allows her an unexpected freedom as she navigates this new and constantly changing world. ‘Frieda’is part of a Scholastic series about new Australians. Previous titles have explored early Irish migration, and more recent Maltese arrivals. Each focuses on a different culture/reason for coming to Australia. Frieda’s story offers insights behind the decisions made by a German family just before the advent of WWI. It’s also a portrait of a young girl heading into adolescence and trying to walk the path between childhood and adolescence in an uncertain time. Recommended for upper-primary readers and anyone interested in history told from the perspective of young people. Here I am, heading off on the bus for my first day at Cordo Hill Primary. The weather is rainy and gloomy, which is exactly how I feel. Starting at a new school is scary. The trip is long and boring. I feel myself drifting into a daydream. Jack has just started at a new school and he’s a little apprehensive. His first attempts to make friends and to fit in are a bit rocky, but he’s soon making people laugh and seems to be settling in. There’s only one boy, Mark, who doesn’t think Jack is funny. No matter what Jack does, Mark seems determined not to like him. It’s going to be a big first day. Colour illustrations appear on every opening, and there are headers and footers reflecting elements of a school day. ‘One More Friend’ is part of the ‘Mates’ series from Omnibus Books. Each title offers a particularly Australian story, full of humour. Jack is a relatable character, his early nervousness manifesting in a certain clumsiness. This makes others laugh at him, but soon he’s realised he can make them laugh with him. Only Mark doesn’t laugh, and it takes a while for Jack to realise why. Rather than laugh at Mark, Jack quietly helps him and in the process makes another friend. This is a realistic depiction of school life as it should be, with characters having the insight to look behind bullying behaviour to see the world from the perspective of the bully. Go Jack! Recommended for newly-independent readers. It’s not that easy being a princess, you know. I mean, you’re flat out finding anything even resembling a decent prince to go to the Year Eight disco with. And you just try shopping for a nice new tiara in downtown Mullumbimby. As if. Not to mention anything like glass slippers: non-existent. Nothing more exotic that Super softs and hush Puppies ever hits the Mullumbimby shoe shop. And what do you do when the kids at school don’t curtsy to you? Have them exiled? Being a princess? I tell you, it’s nothing but problems. What do you do when your parents decide it’s groovy to call you Parsley? And your sisters Sage, Rosemary and Thyme? How much worse can life be as you head off to secondary school on the bus? Well, much worse. When her Dad declares their property the Principality of Possum Creek after a feud with a neighbour, her school life goes straight to the dogs. The trio of ‘blondes’ have a field day. It’s not that she wants to be a ‘blonde’, more that she just wants to get along with everyone and fit in. But if that’s going to happen, she’s going to have to find a way to adjust to her new status. Retreating to the drum class is not going to cut it. ‘Princess Parsley’ is hilarious. When you’ve spent your primary years at a school in Mullumbimby, and your parents are, ahem, alternative, there was always going to be waves when you hit the bigger world of secondary school. Parsley is open and honest, responsible and well-loved and it is a surprise to her that not everyone else views the world from that strong platform. Parsley’s year is full of ups and downs and she carries the giggling reader with her through all her trials and travails. Hidden deep inside the hilarity are themes around family, belonging, bullying and more. Recommended for mid- to upper-primary readers. I was surprised when Nana first told me that when he grows up he wants to be the President of Ghana. We were sitting in the rain, our heads tipped back and our mouths open. I knew Grandma Ama would eventually find us and call us silly children and tell us to go inside and have a wash. But we were enjoying sitting in the rain while we could. Figgy and her friend Nana are back in a new Ghanian adventure. Nana is sure he will be President one day and it sets Figgy thinking about her own future. While she’s busy thinking about it, she is given a part in a film, her mother reappears and Nana is taken away by his father. Soon there is too much going on for her to spend any time thinking about the future. She needs all her energy to stay safe, and to keep those around her safe. Fortunately she is energetic and resourceful. 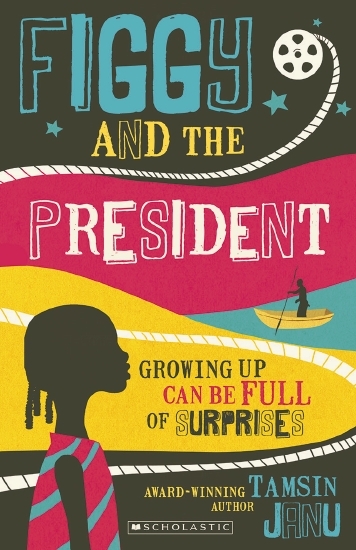 ‘Figgy in the World’ was a delightful story of innocence and determination in contemporary Africa and Figgy and the President continues the wonderfulness. Figgy may have an engaging continued innocence about her, but she’s a match for anything her uncertain world throws at her. Along the way she reconnects with old friends and makes new ones. Figgy reminds us of the importance of family (in its broader sense) and introduces us to a world both familiar and unfamiliar. Highly recommended for mid-primary readers and anyone wanting an inside look at another culture. My brother Ryan spots the dog first, but it’s me who crawls under the bushes to see if he’s okay. The dog whines in pain. Ryan peers through the leaves. Dillon and Ryan live in a small town surrounded by cattle stations. They’re missing having a dog, after the death of their old dog, Buster. So when they spot an injured dog, they hope he can come home with then. There’s only a couple of problems. Firstly, Mum is still mourning Buster. Secondly, this dog is injured and will need vet treatment – and they have very little money between them. They are undaunted though. Ingenuity gets this dog to the vet, and if they have their way, ingenuity will help them find a way to pay the vet. Each opening has borders on each side and there are black and white images on every page. Cover art introduces both the boys and the dog they rescue. 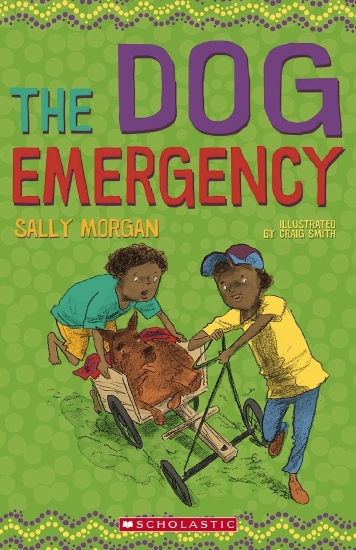 The Dog Emergency introduces everyday life in a small country town. Two boys (who incidentally happen to be indigenous) encounter a dog who just might become their new pet. They are determined and resourceful boys and even though they know there’s no guarantee they’ll take the dog home, they make sure he gets the care he needs. It’s their way of dealing with missing Buster. A lovely story of everyday life, of boys and dogs, of love and loss, and family and community. Short chapters make this ideal for newly independent readers. Recommended for lower primary.